60 year old Jharna Chitrakar grew up in Patharpratima village in South 24 Parganas. Her father, Akbar Patidar was a patachitra artist and as a child, Jharna would observe him as he worked. But she learnt the art only after she got married at the age of 13. Her husband and her teacher was Niranjan Chitrakar, who passed away recently. She trained for about 20 years under the watchful eyes of her husband. Starting off with assisting him, and sometimes singing the songs for him, she was almost 35 when she began to work independently as an artist. In the early days, husband and wife would move from village to village, entertaining villagers at fairs and selling their art. A chance meeting with the writer, linguist and folklorist, Suhrid Kumar Bhowmik, who along with the late David McCutchion was working on their seminal book - Patuas and Patua art in Bengal, took place in 1995. Appreciative of their art, Bhowmik, who was a college teacher, sent many of his students to their home. He also sent the couple to Kolkata to meet the late folklorist, Deben Bhattacharya. This launched Niranjan and Jharna`s Kolkata connection and they continued to visit and sell their art at numerous private homes. For 45 years, Jharna painted and sang, side by side with her husband. Today, as a widow, she continues to draw and sell pictures on her own. She has stopped participating in fairs as she does not find this economically viable. However, Jharna proudly tells us that her pictures sell very fast, especially her Bangla Patas, based on Puranic themes. Her three daughters, their husbands and two of her sons were trained in the art by her husband, while Jharna taught them the songs. Sadly, she lost her elder son, Tapan, a promising Patua, while Niranjan was still alive. She finds that her youngest son-in-law, Phojlur Chitrakar`s work is remarkably similar to that of her husband`s. Jharna continues to tutor her daughters in Patachitra songs and conducts informal classes in her village regularly where anybody who is interested is welcome. 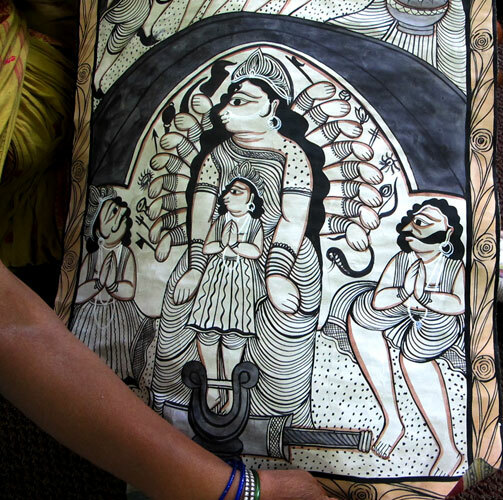 Even though she has to cater to modern demands and thus paints the occasional social theme based patachitra encouraged by the government, Jharna`s heart lies in the scrolls with Puranic themes. Jharna also paints on greeting cards and T`shirts. While she uses acrylic paints on textiles, she continues to use natural dyes collected from plants and herbs when they are in season and stored away in individual coconut shells. She has travelled to Delhi, Bhopal, Rajasthan and Kerala and has received numerous awards and certificates, including national and district awards.